We welcome the introduction of the newest rule release from Talos. In this release we introduced 21 new rules of which 0 are Shared Object rules and made modifications to 8 additional rules of which 0 are Shared Object rules. We welcome the introduction of the newest rule release from Talos. In this release we introduced 59 new rules of which 13 are Shared Object rules and made modifications to 19 additional rules of which 1 are Shared Object rules. Talos has added and modified multiple rules in the browser-firefox, browser-ie, browser-other, file-image, file-other, file-pdf, indicator-compromise, malware-cnc, policy-other, protocol-tftp and server-webapp rule sets to provide coverage for emerging threats from these technologies. We welcome the introduction of the newest rule release from Talos. In this release we introduced 105 new rules of which 4 are Shared Object rules and made modifications to 18 additional rules of which 0 are Shared Object rules. We welcome the introduction of the newest rule release from Talos. In this release we introduced 18 new rules of which 0 are Shared Object rules and made modifications to 12 additional rules of which 2 are Shared Object rules. Talos has added and modified multiple rules in the blacklist, browser-ie, exploit-kit, file-image, file-pdf, indicator-compromise, malware-cnc and server-webapp rule sets to provide coverage for emerging threats from these technologies. We welcome the introduction of the newest rule release from Talos. In this release we introduced 55 new rules of which 15 are Shared Object rules and made modifications to 11 additional rules of which 0 are Shared Object rules. this release and are identified with GID 1, SIDs 44819 through 44820.
this release and are identified with GID 1, SIDs 44809 through 44810.
this release and are identified with GID 1, SIDs 44811 through 44812.
this release and are identified with GID 1, SIDs 44813 through 44814.
this release and are identified with GID 1, SIDs 44815 through 44816.
this release and are identified with GID 1, SIDs 44817 through 44818.
this release and are identified with GID 1, SIDs 44845 through 44846.
this release and are identified with GID 1, SIDs 44833 through 44834.
this release and are identified with GID 1, SIDs 44838 through 44839.
this release and are identified with GID 1, SIDs 44831 through 44832.
this release and are identified with GID 1, SIDs 44829 through 44830.
this release and are identified with GID 1, SIDs 44827 through 44828.
this release and are identified with GID 1, SIDs 44825 through 44826.
this release and are identified with GID 1, SIDs 44823 through 44824.
this release and are identified with GID 1, SIDs 44843 through 44844.
this release and are identified with GID 1, SIDs 44821 through 44822. We welcome the introduction of the newest rule release from Talos. In this release we introduced 55 new rules of which 0 are Shared Object rules and made modifications to 27 additional rules of which 0 are Shared Object rules. We welcome the introduction of the newest rule release from Talos. In this release we introduced 24 new rules of which 1 are Shared Object rules and made modifications to 124 additional rules of which 1 are Shared Object rules. The github repo is updated multiple times per week and the master branch is always clean so that is the best way to get Snort 3.0. The base appid module is built into Snort 3.0 but you will need Open App ID to get the Lua detector plugins. You can use the community rules in 3.0 format or translate other 2.X rules with snort2lua. ODP is the path where you installed Open App ID. Note this path does not include the trailing /odp. INSTALL is the install prefix you used when configuring your Snort 3.0 build. RULES is the path containing the community rules. PCAP is your favorite pcap. You could use -i <iface> instead. I've got version 5.5.1 of ELK installed on OS X. Adjust your paths as needed for your install of ELK. 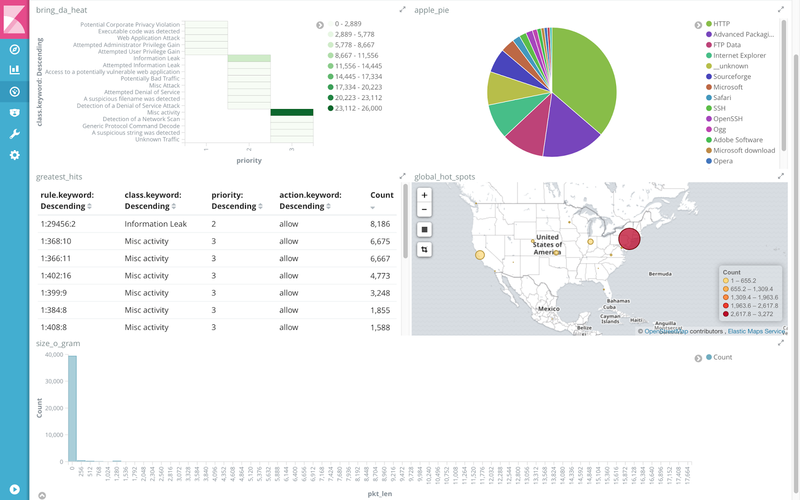 We are using the default ports of 9200 for elasticsearch and 5601 for kibana. You may need to adjust on your system. Click on the gear (Management), Index Patterns, + Create Index Pattern, set the name logstash-snort3j, and then click Create. Edit b64_data (click pencil on right), set Format = String and Transform = Base64 Decode, and then click Update Field. Click on the gear (Management), Index Patterns, + Create Index Pattern, set the name logstash-snort3a, and then click Create. Click the scripted fields tab, + Add Scripted Field, set Name = app_total_bytes and Script = doc['bytes_to_client'].value+doc['bytes_to_server'].value and then click Create Field. At this point you can click on the icons on the left for Discover, Visualize, and Dashboard to view the raw data, create tables, charts, etc., and build a dashboard. This is really best done by just exploring and experimenting, however you can import the dashboard shown above by clicking Management, Saved Objects, Import and selecting snort_dash.json. Tip: base your visualizations off saved searches so that you don't lose them when the data is deleted. snort_csv.txt is also provided for use with snort -A csv if you want to process alerts in csv format. The index name for that is logstash-snort3. * Snort 3.0 supports the target rule option, so use that instead of source address if your rules have targets. That gets the attacker correct for shellcode, etc. We welcome the introduction of the newest rule release from Talos. In this release we introduced 26 new rules of which 14 are Shared Object rules and made modifications to 2 additional rules of which 0 are Shared Object rules. 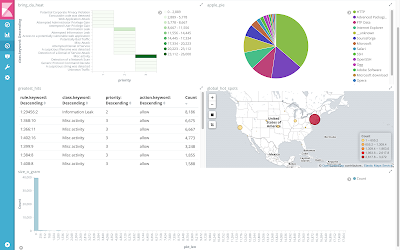 Talos has added and modified multiple rules in the indicator-compromise, policy-other, protocol-snmp and server-webapp rule sets to provide coverage for emerging threats from these technologies. Pushed build 240 to github (snortadmin/snort3). It's been a while since posting so this is a big list! snort2lua: added sf_unified2 to unsupported list and matching log/alert to deleted.